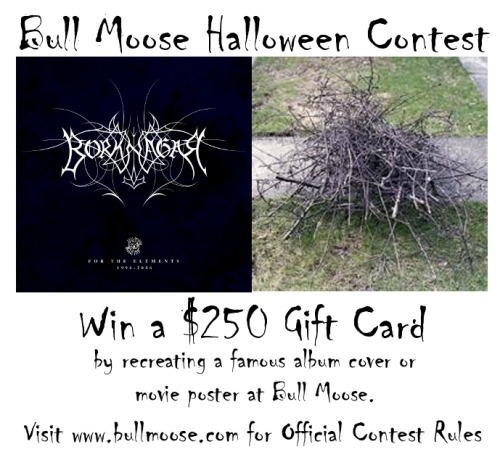 Bull Moose Halloween Contest - Recreate A Famous Album Cover & Win a $250 Gift Card! Bull Moose is hosting a Halloween Contest! Re-create a famous album cover or movie poster in any public area or parking lot of a Bull Moose Store, take a photo of it, and then post your entry to the Bull Moose Facebook page by midnight October 28th. On October 29th, Bull Moose will re-post the best photos and the person whose photo receives the most "likes" by noon on Halloween wins the $250 Bull Moose gift card (runner-ups get $50). But before you get going, be sure to read the Official Contest Rules. Especially if, for example, you were planning on re-creating the Who's Next album cover or something.